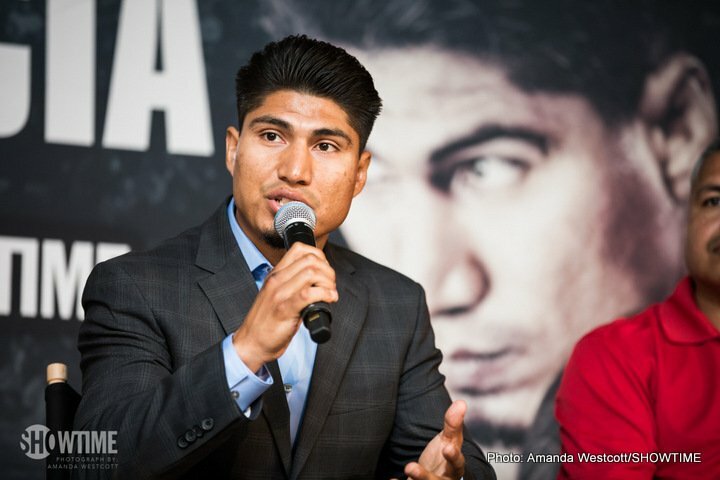 As per a news piece by Dan Rafael of Espn.com, talks had begun a weeks or so ago for a lightweight unification clash between Mikey Garcia and Jorge Linares, to have taken place early next year some time. Well, it ain’t gonna happen after all. Eric Gomez of Golden Boy met with Garcia himself and, surprisingly, Garcia turned the fight, or the fight offer down. We sure would have liked it, but now it seems these two fine fighters are destined to never meet. The latest word is Garcia could next fight Robert Easter Jr, while there is reportedly a big offer for Linares to face Luke Campbell in a return fight of their exciting 12 round split decision won by Linares. Almost positively the two best operators at 135 today barring all other fighters, Garcia and Linares would have put on quite a fight had they actually met as was the plan. Instead, though we have two good fights (in the works) with Linares-Campbell II and Garcia-Easter, we don’t have the big one. Garcia is the harder puncher of the two, and though it was a long time ago now (back in 2011/2012) Linares did show vulnerability in being stopped twice, back-to-back by Antonio DeMarco and Sergio Thompson (Linares also being stopped in 2009, by Juan Carlos Salgado). Might Garcia have overpowered Garcia, even exposed his chin? Sadly we will never know it seems. Linares is a fine boxer, and he has been in with punchers since the days of his three stoppage setbacks, and in winning 12 fights since his last defeat the 32 year old says he is a different fighter these days. If Linares could have either taken Garcia’s power shots or avoided them, he could well have boxed his way to a decision win. But again, we will never know. Can Campbell go one better than in his first heroic showing and derail Linares in a second fight? Might the classy Easter Jr. upset Mikey? If either lightweight champ loses their next fight we can forever forget about that unification clash. Next boxing news: “Creed II” on its way – will it rank alongside these great boxing films?